Did you know 69% of consumers believe that chamber membership is a sign of a reputable, stable business? 70% believe that it demonstrates that you use good business practices. Being a member of the chamber gives your business real credibility. Chamber members receive measurable exposure through our website (business directory, hyperlinks and display ads), print materials, social media and cooperative advertising. You can highlight your business by sponsoring signature events that are open to the entire community: Cordova Cleanup Day, Copper River Delta Shorebird Festival, the Old Time 4th of July Celebration, Cordova Fungus Festival, and the annual Hometown Holiday Kickoff & Tree Lighting all provide excellent exposure for your business or organization. You can even become an All-event sponsor (click here for more info). We are often the first contact for visitors planning a trip to Cordova or their first stop upon arriving to town. We also get hundreds of online searches and calls each year from individuals checking to see if a business is a chamber member or looking for a business to fill their needs. We refer only chamber members. Membership in the Chamber is an investment in your business future as well as our community’s future. As a chamber member you will help sustain and improve the quality of life that you, your family and your employees enjoy. You can also experience the rewards of volunteering your time and talent to help make the community where you live and work a better place. Click here to learn more about volunteering. Your membership dues may be tax deductible – check with your tax preparer. • Contributing to the stability of your local chamber of commerce. • Participating in your local business community at networking and member-only business training events. • Front line contact with new members of the community by way of our Newcomers Welcome Events. • Business advocacy at City Hall, the Courthouse, and our State Capitol. • Close contact with elected officials at both the city and state levels through legislative visits sponsored by the Chamber as well as Candidate forums during local elections. 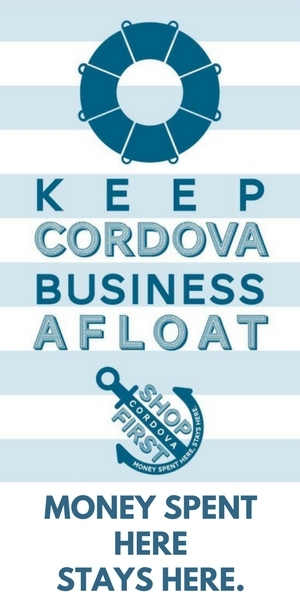 • Opportunity for inclusion in our “Shop Cordova First” campaign. • Access to low cost targeted advertising through our website and cooperative print advertising. New! Multi-Business Discount: The Cordova Chamber is now offering a 20% discount on all additional business memberships (equal or lesser value) purchased by a single party. Plus, sign up for Credit Card Auto-Renew and be entered to win 1 month of free web advertising on cordovachamber.com! Find the right fit for your business. To view Chamber membership levels, click here. To view Chamber Signature Events sponsorships, click here. You can fill out the Chamber Membership Application Form online through Google Forms (click here) which may require a gmail account, use our fillable PDF form (click here to download) and email it back to us (click here to email). You may also fill it out in person at our office at 404 First Street, Cordova. After we receive your membership application, we will send you an invoice via email that may be paid immediately via credit card or bank transfer. You may also pay via check or cash and mail to PO Box 99 Cordova, AK 99574 or drop off at our office at 404 First Street in Cordova. It’s a hassle free way to make sure your Chamber membership never lapses! Once you are enrolled, we will automatically generate an invoice for you every January for that year’s membership (and sponsorship, if desired). You’ll be given time to look it over and make any changes. Then we’ll automatically charge the credit card or bank account on file. To enroll, fill out the fillable form (click here to download), print it out and sign it, scan it into your computer, and then email it to us at office@cordovachamber.com (click here to email). Or you can fill it out in person at our office at 404 First Street, Cordova. Then scan into your computer and click HERE to email it back to us, or drop it off at our office. You may mail in your payment to PO Box 99 Cordova, AK 99574 or drop it off to our office at 404 First Street in Cordova. Enrolling in Auto-Renew is a great way to save yourself time and energy every year remembering to renew your Chamber membership. Don’t worry: before we process your annual payment, we will always give you an opportunity to make any changes to your membership/sponsorship or discontinue. Maintain the highest standards of business conduct by using only legal and ethical means in all business activity guided by truth, accuracy, honesty, fairness and integrity. Conduct all business dealings in a civil, courteous and professional manner and not engage in any act or omission of a dishonest, deceitful or fraudulent nature in the conduct of business activities. Abide by all applicable federal, state and local laws and maintain all necessary insurance, licenses and permits. Be truthful in all advertising and informative materials (print, electronic media, television, radio or otherwise) and ensure such materials do not contain false, misleading or incomplete information. Be current on all financial and operational matters in order to competently deliver a quality customer experience and maintain a high-level of customer service. Strive to be good stewards of Cordova’s environment, cultural heritage and unique quality of life. Represent Cordova, Alaska tourism and the Cordova Chamber of Commerce to visitors, businesses and other stakeholders to aid in the advancement of the visitor industry and to grow the awareness of the economic impact of tourism within the community. Be fair and respectful to employer(s), employees, associates, competitors, visitors, the public, and all business or professional relationships. Cordova Chamber of Commerce members should raise and maintain these levels of professional conduct. Joining the Cordova Chamber of Commerce represents a member’s agreement to these Guiding Principles of professionalism and integrity. It is the responsibility of all members of Cordova Chamber of Commerce to report any suspected violations of the code of ethics to Cordova Chamber of Commerce.